UN-backed investigators say Israeli soldiers intentionally fired on civilians and could have committed crimes against humanity during a string of crackdowns against Palestinian demonstrators last year in Gaza that left 189 people dead. United Nations-backed investigators said Israeli soldiers intentionally fired on civilians and could have committed crimes against humanity during a string of crackdowns against Palestinian demonstrators last year in Gaza that left 189 people dead. Israel rejected their report as "hostile, false and biased." 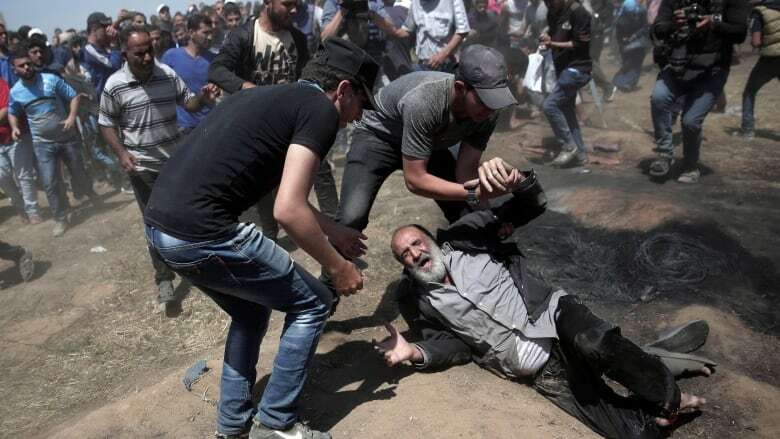 The independent Commission of Inquiry mandated by the Human Rights Council said more than 6,000 people were shot by military snipers using live ammunition to repel protesters near the separation barrier. The panel showed video of grisly shootings of protesters as it issued a report on the violence that began in March. The three-person panel said civilians who did not pose an "imminent threat" were among those killed and injured. It acknowledged significant violence linked to the demonstrations, but said they did not amount to combat campaigns, essentially rejecting an Israeli claim of "terror activities" by Palestinian armed groups. "Between the 30th of March and the 31st of December, we found that 189 Palestinians were killed — 183 of them with live ammunition," said Bangladeshi lawyer and commission member Sara Hossain. Alluding to Israeli soldiers, she said, "we are saying that they have intentionally shot children, they have intentionally shot people with disabilities, they have intentionally shot journalists." The panel said Israel needed to do more to allow the injured, even today, to gain access to proper medical care, and urged Israel's government to authorize a "meaningful" investigation into the events. The commission also faulted Hamas, which runs Gaza, for not preventing use of incendiary kites — low-tech weapons with flaming tails designed to ignite fires — during the protests. The Hamas-led protests were fuelled initially by calls for the "right of return" of Palestinian refugees to go back to long-lost properties in what is now Israel. They later turned into a weekly demonstration aimed at easing a blockade imposed on Gaza. Israel imposed the blockade after the militant group Hamas seized control of Gaza in 2007. Israel and Hamas have fought three wars since then. Israel's acting foreign minister said his country "completely rejects the report." "The Human Rights Council's theatre of the absurd has produced another hostile, false and biased report against Israel," said Israel Katz, speaking of his country's right to defend against "a murderous organization" — his government's position on Hamas. "Nobody can negate Israel's right to self-defence and its duty to defend its citizens and borders against violent attacks," he said. Prime Minister Benjamin Netanyahu also slammed the report, saying in a statement that the UN Human Rights Council "is setting new records for hypocrisy and mendacity, out of an obsessive hatred of Israel." Netanyahu has stressed Israel's right to self-defence and blamed the Gaza border violence on Hamas, a group he accused of firing missiles at Israeli citizens and throwing explosive devices at soldiers. The report was based on 325 interviews and meetings with victims, witnesses, government officials and members of civil society from all sides, and more than 8,000 documents. The panel said its mandate was to identify those it believed responsible for the violations, and it planned to hand over a confidential file with such information to UN human rights chief Michele Bachelet, who could hand it over the International Criminal Court and national authorities. The Israeli government has repeatedly lambasted alleged bias against Israel by the 47-member Human Rights Council. The Trump administration pulled the U.S. out of the council last year, citing in part such alleged bias. Commission chair Santiago Canton of Argentina​ said such commissions of inquiry on violence in the Middle East date back nearly a century — to the League of Nations, the UN's predecessor — and he decried a "failure" of the international community to respond. "The only way that we will find the solution to all the killings taking place is if the international community takes the responsibility of taking this issue more seriously, and finding a peaceful solution to this conflict," he said. Israel says its army is defending the country's border against violent infiltration attempts and accuses Hamas of using the large crowds as cover to carry out attacks. Protesters have hurled flaming tires, grenades and firebombs at soldiers and attempted to cut through the fence with wire cutters. One soldier was killed by a Palestinian sniper last July. Critics say Israel has repeatedly used disproportionate force in non-life-threatening situations. They point to the large numbers of unarmed people who have been shot, including women, minors and medics, often while standing hundreds of metres away from the barrier.